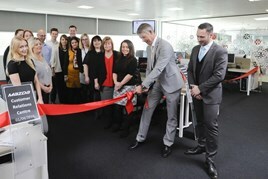 Mazda UK has brought its customer relations offering in-house, officially opening a new call centre within its Dartford headquarters. A 20-strong team of customer executives will handle all types of contact with Mazda owners and potential purchasers at the new facility which was opened by Jorgen Olesen, the outgoing vice president of customer service and logistics at Mazda Motor Europe on April 1st. “Our aim is to deliver a personal service that ensures everyone who deals with Mazda feels connected and is positively surprised throughout”, said Andrew Beale, Mazda UK’s head of customer relations. With around 5,600 inbound contacts to the business each month, the Mazda CRC team will answer customer queries by phone, email, web chat or social media. Within the CRC team are specialists in warranty, service, Motability, fleet and product.